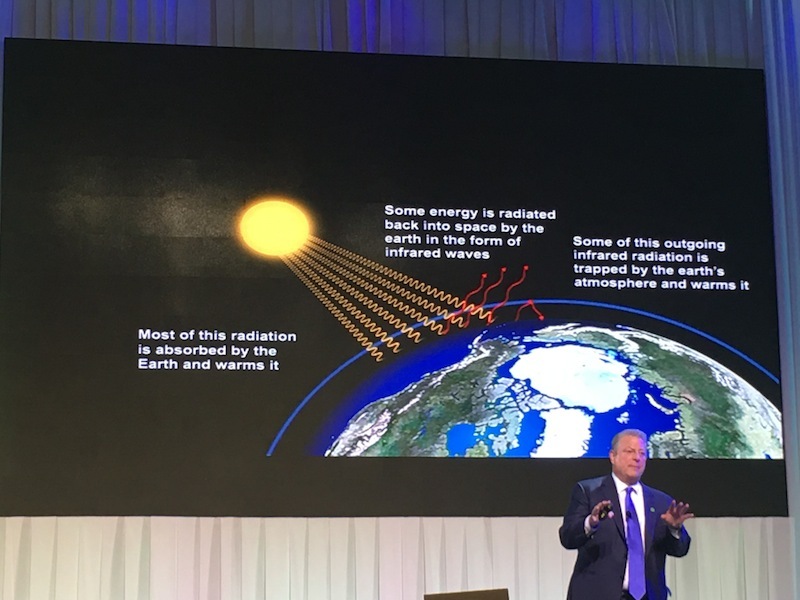 Al Gore, the Nobel laureate and former US Vice President urged the Philippine government on Monday to accelerate the phase-out of coal-fired power plants in the country and shift towards cleaner, less carbon-intensive sources of energy like solar, wind and geothermal. He added that for the past few years, the cost of solar panels for instance is becoming cheaper and more sustainable for people in the rural communities. “The age of revolution is beginning. Renewable energy is all good except coal companies does not like it,” Gore said. The Philippines’ electricity sector and primary energy consumption are currently dominated by fossil fuels. Over 74 percent of the country’s generated electricity and nearly 87 percent of its primary energy came from fossil fuels in 2014, primarily from coal and oil. The Department of Energy announced last year that 25 new coal-fired power plants are in the pipeline. Senator Loren Legarda, who authored various environmental laws in the Philippines, said one of the daunting challenges facing the country is its heavy use of coal. “Cities will not stop from growing, but they need to find more sustainable and efficient ways of providing and using energy. Economic growth and boosting energy security, however, need not compromise the world’s future,” Legarda said in her presentation. Citing the World Energy Outlook Special Report 2015, Legarda said over the past two-and-a-half decades, global carbon dioxide emissions increased by more than 50%. Since 2000, the share of coal has increased from 38% to 44% of energy-related carbon dioxide emissions. The annual carbon dioxide emissions of the power generation sector increased by an average of 1.2% in the last decade of the 20th century. It has turned for the worst between 2000 and 2014, when the average annual rate of increase accelerated to 2.3%. By the year 2030, the Philippines would need an additional 13,167 megawatts of power capacity, more than half of which is expected to be generated from coal-fired power plants. In fact, 25 coal-fired power plants that have been granted Environmental Compliance Certificates are now either operational or under construction. Philippine consumption of coal has been on the upswing, which increased by 27% between 2012 and 2014, Legarda noted. She added that there is a dearth of studies on the health impacts of pollution from coal-fired power plants in the Philippines, but the cases studied point to the unequivocal truth–coal-fired power plants have generated health concerns in host communities. Renewable energy currently accounts for 33% of the country’s energy mix. The National Renewable Energy Program has set out aggressive targets on renewable energy development from 2011-2030, aiming to increase renewable capacity to 15,304 megawatts by the year 2030. We have the legal framework that provides the necessary policy mechanisms such as the Feed-in Tariff, Net Metering, Renewable Portfolio Standards, Green Energy Option, Renewable Energy Market, and other fiscal incentives such as income tax holiday, she noted. “There have been challenges, however, in our efforts to fast track the development of our renewable energy resources more aggressively. Impacts on electricity pricing have been a major consideration among our regulators, particularly as we already have one of the highest electricity rates in the world,” Legarda said. Moreover, Legarda said, renewable energy is recognized as a long-term solution to the global effort to address the climate crisis. It could help mitigate the environmental impacts of our expanding energy use. Legarda said she will introduce an energy efficiency bill as part of our country’s decarbonization effort. “Although the Philippines is not a major emitter of GHG, we cannot let our economy grow through the ways that caused today’s climate crisis; we cannot let human society live in a world fraught with dangers,” Legarda said.